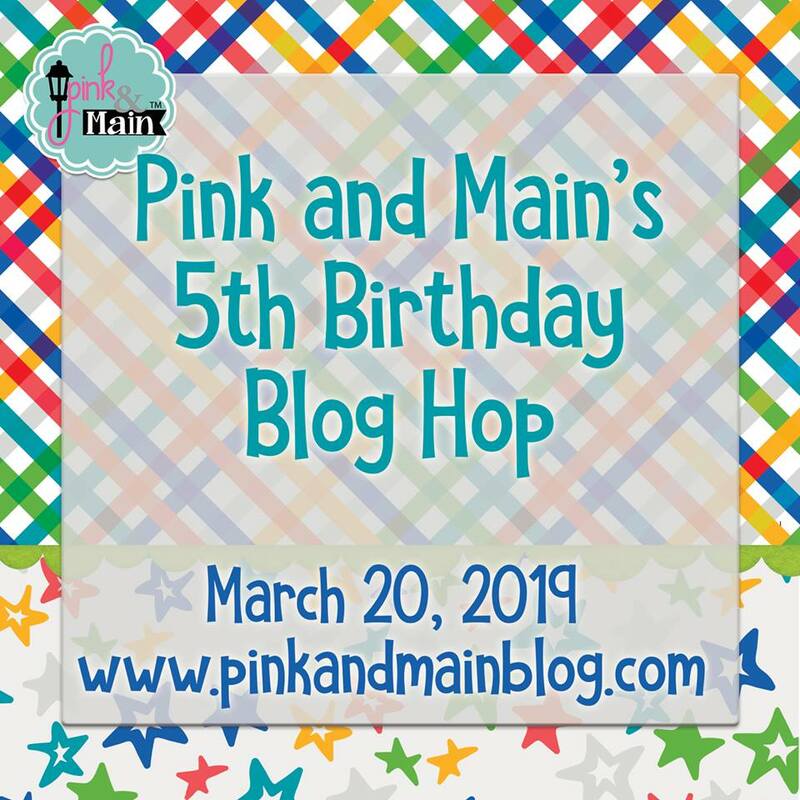 Happy 5th birthday to Pink & Main! 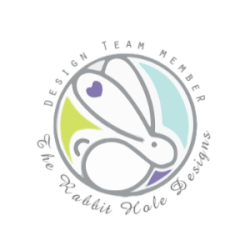 They are one of my most loved companies and I am so thrilled and honored to be a part of their birthday bash! As if it's not exciting enough that Pink & Main is celebrating a birthday - their new release is live in the shop today! Make sure you head over and fill up your cart! 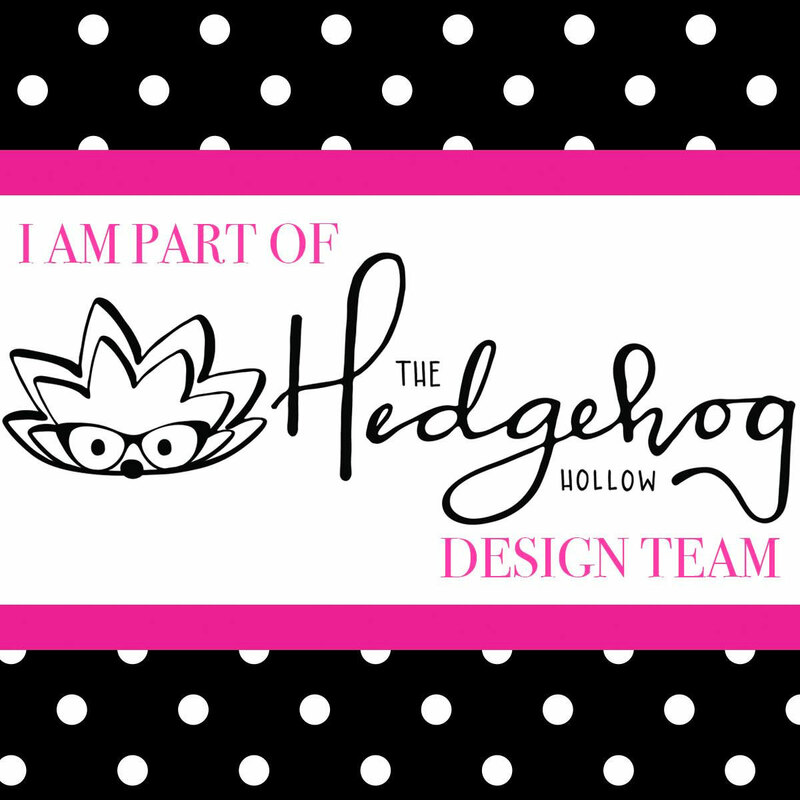 I hope that you will hop along through all of the designers' blogs! There's so much inspiration! And prizes! Don't forget prizes! Pink & Main is giving away FIVE $50 gift certificates to the Pink & Main store to FIVE random winners! To be eligible to win one of these fabulous prizes you must have commented on EVERY blog in the hop! But why wouldn't you want to?! There's so many pretty things to be seen! With that - let's see mine! I decided to use the new BEE Day stamp set to create a double shaker card! This is the first time I made a card like this, but it was relatively easy once I figured it out! I started by taking two landscape cards, turning them sideways, and gluing the backs together to make a tri-fold card. I used a circle die to cut a circle from the center of the front of the card, then I closed my card and traced the outline onto the inner flap of the card, lined up my die, and cut a second circle so that I had a sort of "tunnel" going through the two flaps of my card to the back. I stamped my sentiment and little bees from the BEE Day stamp set onto the front of my card and added some simple coloring to the bees. 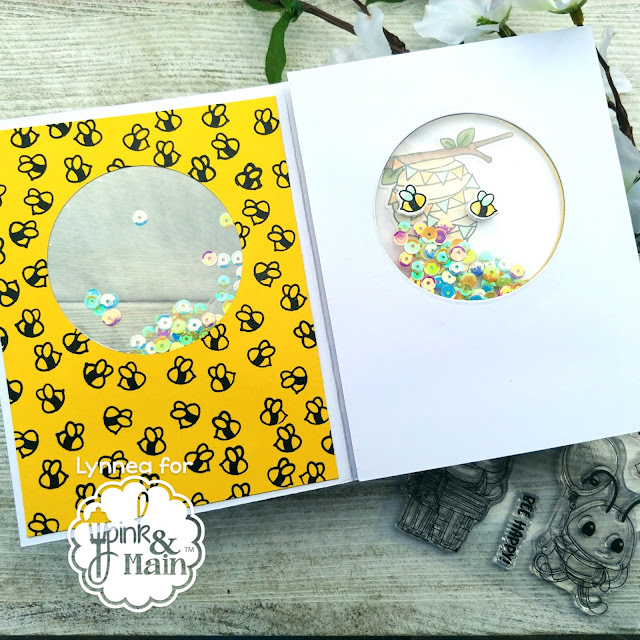 I wanted the inside to have pops of color and I also needed some way to sandwich my shaker pouches into my card, so I trimmed a piece of yellow cardstock to be slightly smaller than my card and again lined up my circle die and cut out a circle window. 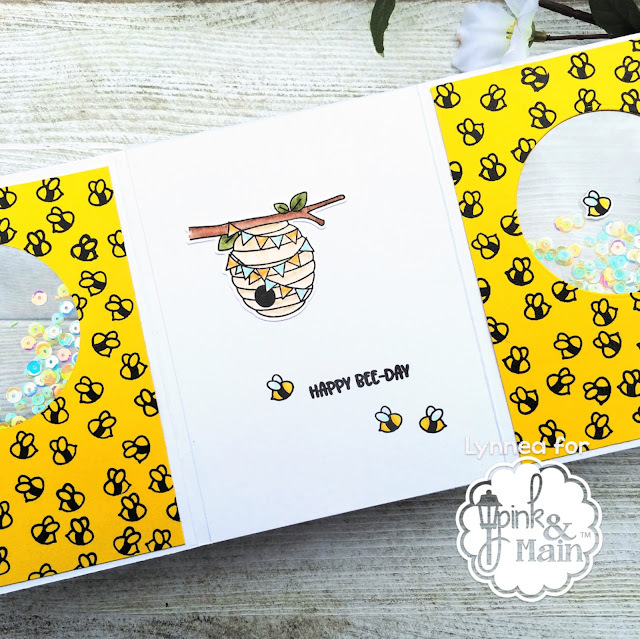 To add a bit more interest I stamped the little bee image from the BEE Day stamp set repeatedly and added clear embossing powder for some shine. I did this twice so that I would have a panel for both inside portions of my card. To create my shaker pouches I cut a rectangle from a piece of acetate and added strong double sided adhesive around a 4 sides. I added some sequins to the middle and removed the backing from the tape and folded it in half to create a square with sealed edges and sequins in the middle. This allows me to create a flat shaker, but there's still enough space in the middle that the sequins can move around a bit. I made 2 shaker pouches and adhered them to the back of the yellow pieces of cardstock and sandwiched them between the card base and the cardstock. I stamped the bee hive and some more bees from the BEE Day stamp set and cut them out with the coordinating dies and added them to my card. I am so excited about how this card turned out! And I love how you can see straight through the front to the back where the little bees are buzzing around their hive! Now on to the hop! Remember that to win one of FIVE $50 giftcards to the Pink & Main store you need to comment on each stop in the hop! Good luck! 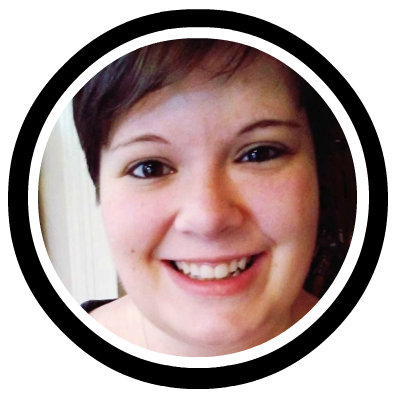 Lynnea H. - you are here! Good luck to everyone! And happy 5th birthday to Pink & Main! Your shaker card is fabulous.. Girl - LOVE this! The bees inside with the yellow - just blew me away!!!! Great card! Love the shaker and it’s just so pretty and colourful! Wow! This card really pops! Great card! WOW- double shaker!! Mind blown! Sooo cute! Your card is just stunning, I've never seen a shaker card done in this manner bee-fore...lol! Sorry, couldn't resist..lol! Thank you so much for sharing with us. I love this shaker card. Do you have a you tube showing how to make it? I don't! But that's something I could work on! Those yellow insides are FAB! I love the inside of your card. Such a cute shaker!! Wow! Amazing card! Love the double shaker element. Super ingenious idea for the double shaker. It gives me so many ideas. Super creative card! And love the bee paper! AH!!! This shaker is awesome I love how it opens up with the bee paper inside! Sweet shaker card! Love the bees! Oh my ...this card is amazing! I adore this design, thanks for the inspiration! Your card is amazing! A double shaker with the bees -- that's brilliant! Love the bright yellow when you open the card. What a darling card! Perfect for this birthday celebration! Cute shaker design with all of these little bees. Oh, what a cute idea! I've never seen a double-shaker like this! Love it! Awesome double shaker card!! Such a creative idea! Love it! Wow, you created the most adorable double shaker card. Lovely shaker card Lynnea. Fabulous release from Pink and Main. So cute!! Love the interior with the yellow background and little bees!! Awesome!! WOW - amazing card! Love this double shaker idea! Thanks for sharing! Your shaker card is AWESOME!! It is my favorite card to make!! Beautifully done!! Oh those bees are just too cute. Fantastic card, how fun is that tri-fold shaker! Adorable! I've never seen a double shaker card before. I love the inside flaps with all the tiny bees stamped on them. Such a creative card! Awesome card! Just love the bees. Thanks for the chance to win and sharing. Oh my--shaker card is amazing and Beee-utiful! Those tiny bees are adorable. Tri- fold with shaker is something new for me, love your card!! Shakers are always fun, love how you added pattern paper inside too, great card. Your shaker card is wonderful!! I love the bright colors and the bees are so cute! Thank you so much for sharing! Trifold card with double shaker card is quite unique and new for me. Love how created your own pattern paper. So fabulous. Love it. The double shaker is so delightful and sure to be appreciated, such a fab surprise when the card is opened. Hello! My name is Lynnea. I am a wife, mom, daughter, sister, and a friend. I've been papercrafting and cardmaking since I was 13! I'm overjoyed to share my love of crafting with you and I hope you'll find inspiration for your own crafts! - Your interactions with our website will be tracked for marketing campaigns. By hitting the "submit" button below you are actively agreeing to the above. 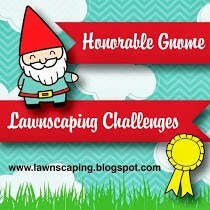 Unless otherwise stated, all content on this blog is my own. These are my own words and my own projects. Please feel free to use these projects as inspiration, but do not copy them for monetary reproduction. This blog may use affiliate links at no cost to you.